“Do you use filters to protect your lenses?” This is a real common question and the answer is a giant yes and it’s time to replace them, again! Ya, I’m aware of resolution chart tests, lists of photographers who don’t and how the image quality is degraded by using the filter. Silly me, I still use filters on all my lenses that accept them. Yes, technically, I’m sure that there is some degradation of the image quality. And no, I’ve never had a photo buyer say, “I’d use your photo but you used a filter to protect you lens and I can see the image quality suffer because of it! Which is easier to replace, the Nikon NC 77mm filter or the front element of the 24f1.4AFS? This one pictured is on my 18-35AFS and I replaced it just a year ago. Why? I work in conditions that can be unkind to lenses. The 18-35AFS gets a ton of environmental abuse and I often clean off the filter with the corner of my shirt. Came back from an air to air shoot and the filter on the 80-400VR3 had a real fine coating of oil on it! 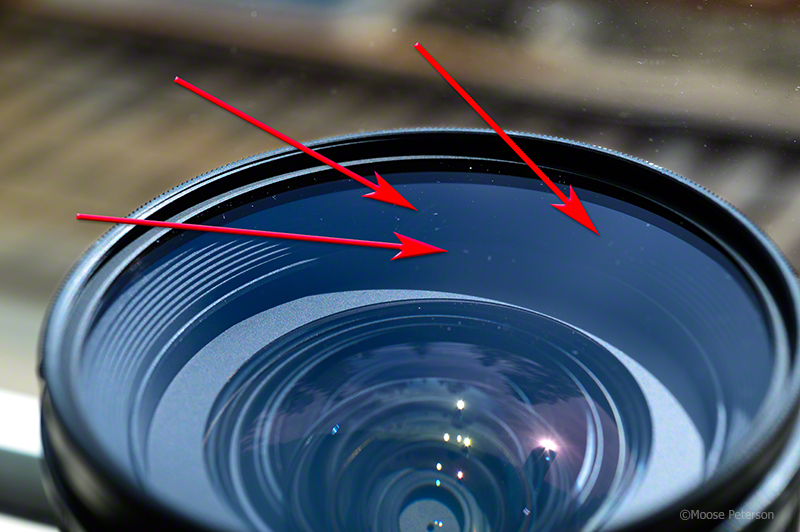 So glad I had a filter because the air stream would have forced that oil inside the lens. Why do I use the Nikon NC filter? Because of its mount, thin and metal and the glass is pretty sweet as well. And the fact I need to keep replacing the filters tells me that they are doing their job so I can do mine.